Our mid-range complete drop-in Fire Pit Kit comes fully assembled in Stainless Steel and is ready to be connected to 1/2 in gas line. An easy to use Fire Pit at less than half the cost of our Remote Electronic Ignition Kits. This Kit utilizes a Safety Pilot thermopile to safely control gas flow. If there is no fire there will be no gas flow. It also includes a Manual Spark Igniter so there need for a standing pilot on all the time. Simply flip the ignition spark switch, depress the black knob for 30 seconds and enjoy! 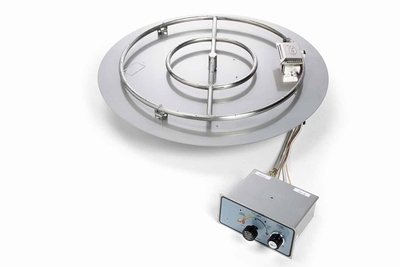 Flat Pan Kits are a perfect solution for Fire Bowls or ceramic pot installations.